Peter, an apostle of Jesus Christ, to the strangers scattered throughout Pontus, Galatia, Cappadocia, Asia, and Bithynia, Elect according to the foreknowledge of God the Father, through sanctification of the Spirit, unto obedience and sprinkling of the blood of Jesus Christ: Grace unto you, and peace, be multiplied (1 Peter 1:1-2). We live in a strange land, the world is not our home (Hebrews 13:14 NLT). Our beautiful home country is heaven with the capital being the New Jerusalem (Revelation 21:2). Blessed be the God and Father of our Lord Jesus Christ, which according to his abundant mercy hath begotten us again unto a lively hope by the resurrection of Jesus Christ from the dead, To an inheritance incorruptible, and undefiled, and that fadeth not away, reserved in heaven for you (1 Peter 1:3-4 ). Who are kept by the power of God through faith unto salvation ready to be revealed in the last time (1 Peter 1:5). 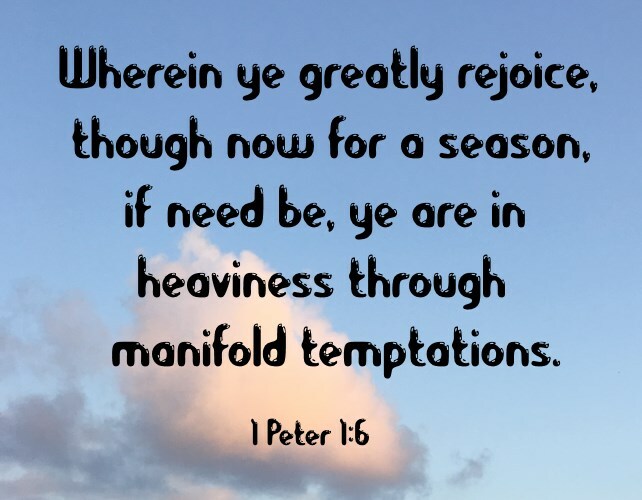 Wherein ye greatly rejoice, though now for a season, if need be, ye are in heaviness through manifold temptations (1 Peter 1:6). agalliáō, ag-al-lee-ah'-o (G21); from agan (much) and G242 (gush up, leap up spring up); properly, to jump for joy, i.e. exult:—be (exceeding) glad, with exceeding joy, rejoice (greatly). These trials will show that your faith is genuine. 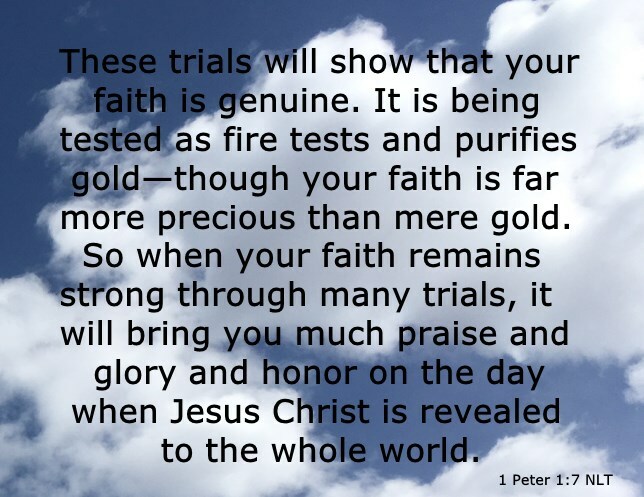 It is being tested as fire tests and purifies gold—though your faith is far more precious than mere gold. So when your faith remains strong through many trials, it will bring you much praise and glory and honor on the day when Jesus Christ is revealed to the whole world (1 Peter 1:7 NLT). Yes indeed, the trial of our faith, through heat, means that our impurities are being removed by the Holy Spirit. We want to thank God for every trial. We need to jump for joy when this happens, instead of climbing into our "me me" tree and having a pity party. There should not be any need to stress our stresses. Our trials should never stop our rejoicing. In fact, we should just be able to tell our stresses, our struggles, our trials to just get lost, and then leap for pure joy as we know we are going to spend eternity with Jesus Christ. an-ek-lal'-ay-tos; from G1 (as a negative particle) and a presumed derivative of G1583; not spoken out, i.e. (by implication) unutterable:—unspeakable. unspeakable: 1 Peter 1:8 (to which words are inadequate). Peter also used rejoice - agalliáō in verse 8 (part of our opening scripture), just like he did in verse 6. Little wonder he used agalliáō, if words are inadequate to describe our joy, then yes, we need to gush-up, leap-up, jump-up, spring-up for joy, since we have the Holy Ghost, having obeyed the Gospel (1 Peter 1:12) and because of the grace of God (1 Peter 1:13) we look forward to heaven and its capital, the New Jerusalem.